A WW1 casualty medal group awarded to Major William Henry Archbutt, who had previously served with the Territorial’s (he has London Gazette entries dating from before the war), and joined the regulars at the outbreak of hostilities, serving with the 9th Battalion Manchester Regiment (Ashton Territorial’s). Archbutt was serving with the battalion when it was transferred to East Lancashire Division, and it took up duties as a part of the Egypt Garrison. Archbutt’s Medal Index Card, (which can be viewed by clicking on here, if you have access to Ancestry although a paper copy will be provided with this listing), confirms that he arrived in Egypt on 21st September 1915 (although this is an error and should state 1914 see ‘further details’ below). Details of the battalion’s actions and activity can be viewed by clicking on here. 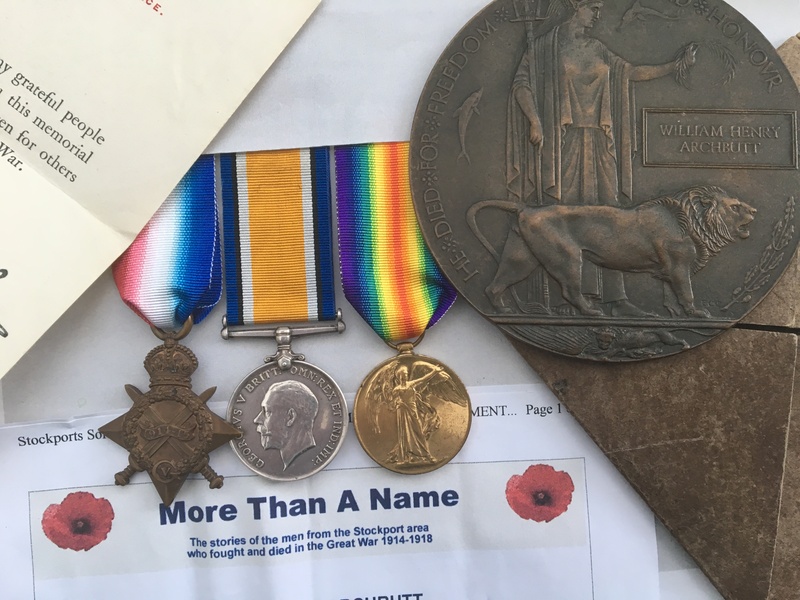 Archbutt died on the 8th February 1915 (of heart failure), and his Commonwealth War Graves Commission entry can be viewed by clicking on here. He is remembered on the Cairo War Memorial Cemetery, Egypt. 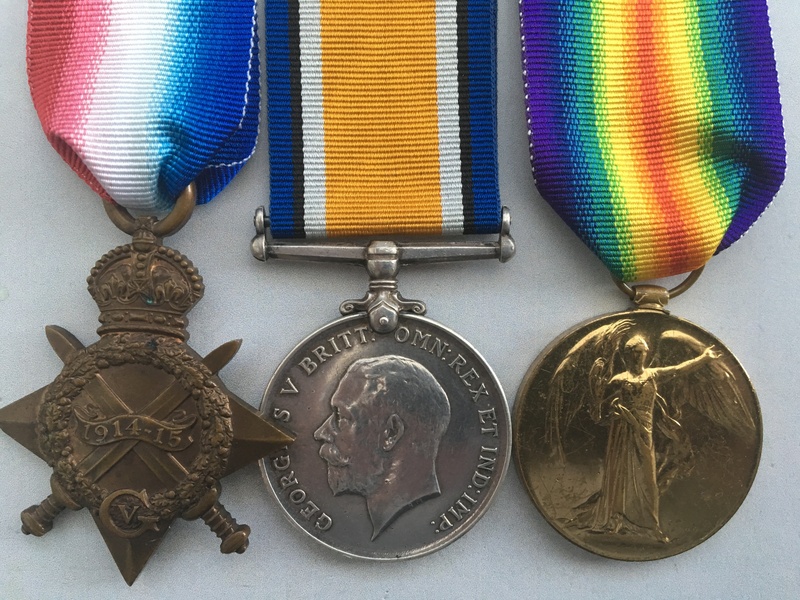 Victory Medal named to MAJOR W. H. ARCHBUTT. Memorial Plaque named to WILLIAM HENRY ARCHBUTT. The medals are supplied loose with replacement ribbons. The memorial plaque includes its original cardboard outer and condolence slip. 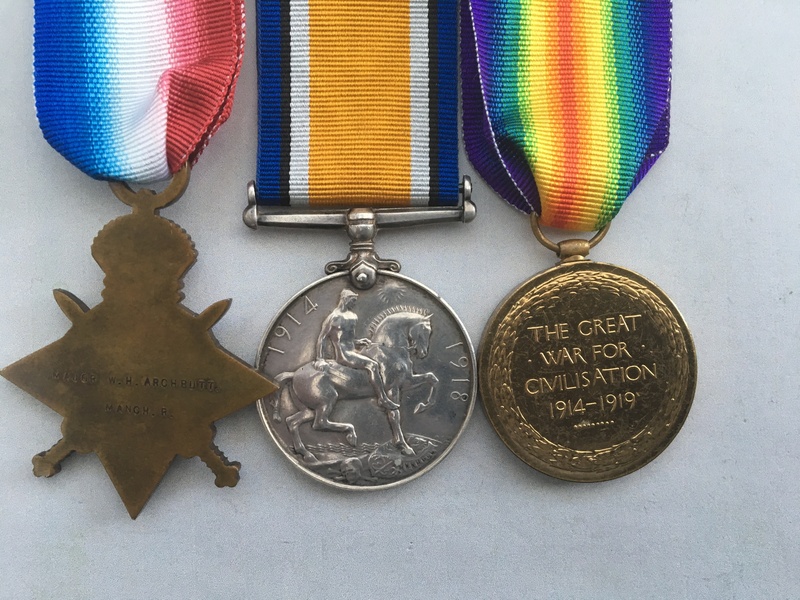 Sadly, the British War Medal is missing, but the gap filler is an original WW1 era medal which has been erased (not by me I might add). Archbutt is also remembered on websites dedicated to the men from Stockport and Cheshire who died in the Great War, these details can be viewed by clicking on here and on here. Fortunately, these websites give a good account of his life, so I’ve not undertaken no further research into this man. 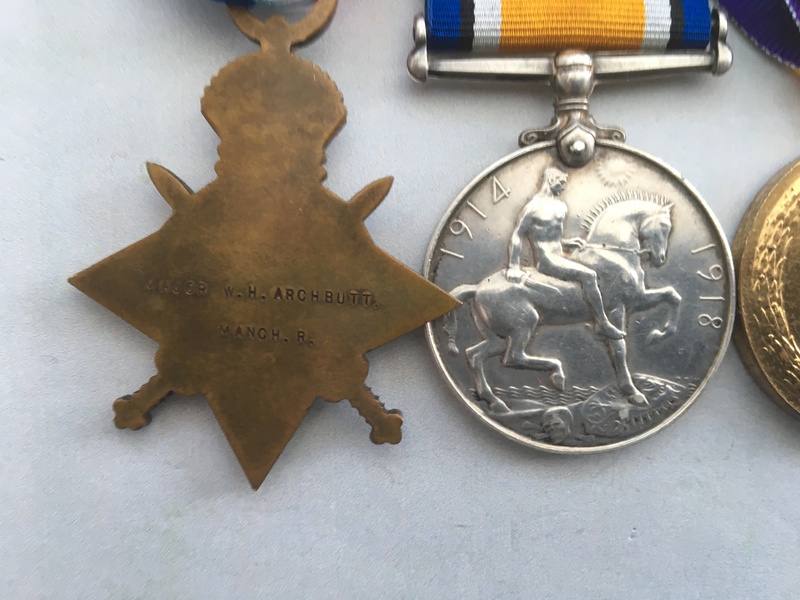 Details of his military career (along with an image of Archbutt) can also be viewed by clicking on here - you will need to scroll down a little to find the entry. It is curious that on his Medal Index Card he is recorded as having entered the Egyptian theatre on the 21/9/15 while his date of death is officially recorded as the 8/2/15 prior to his arrival in theatre - This appears to be an administrative error, as a review his Medal Roll details (which can be viewed by clicking on here and on here - again if you have access to Ancestry), indicate that he arrived in theatre in 1914. Price £495 - please read the terms and conditions below.